Life is so magical and beautiful indeed we should live it fully. 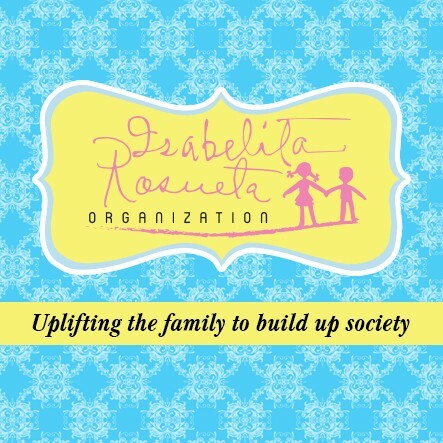 As a way of sharing and helping others, for the past 3 consecutive years Isabelita Rosueta Organization (IROG) make it to a point of extending help to the newborn babies in San Marcelino Hospital. The smile from those loving parents is undeniably the proof of how happy they are in having their bundle of joy. IROG is always looking to the positive side that those newborn babies could make a difference in the future. Let them feel that we are always ready to guide them in facing what the world would give. As part of the celebration for the World Breastfeeding Awareness Week and National Breastfeeding Awareness Month every August, Isabelita Rosueta (IROG) Foundation participated in the HAKAB NA OLONGAPO 2017 with the theme “Sama-sama nating ibalik sa uso ang pagpapasuso” at Harbor Point Ayala Mall Activity Center last August 5, 2017. The event was spearheaded by the Breastfeeding Pinays Olongapo (BFP Olongapo), with the advocacy of promoting breastfeeding in Olongapo, Zambales and Bataan. They are educating the mothers and soon to be moms the importance of breastfeeding not only for their babies but as well as for themselves. The event was a success with the participation of 127 breastfeeding mothers, 127 babies who latched on successfully with a total of 405 people in attendance including the volunteers and supporters. Members of IROG Foundation, along with LGO employees, used this quote as our inspiration in giving excellent service to adorable little children during our recent activity called “Soup Kitchen Activity” at Sta. 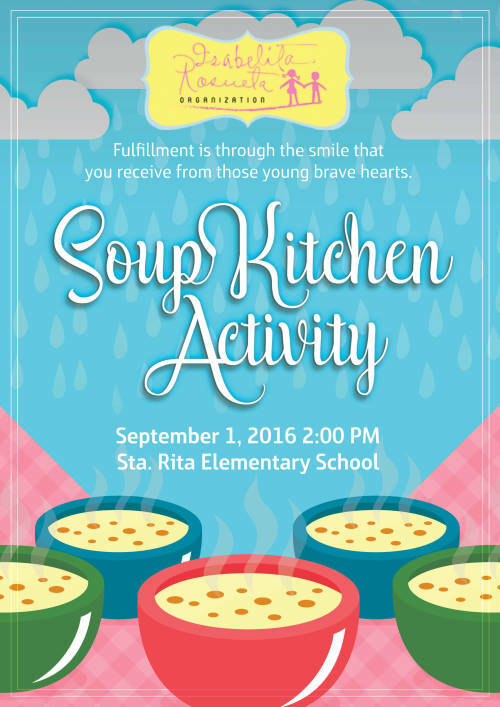 Rita Elementary School on September 1, 2016. September 1 seems to be an ordinary day for all Grade 1 students of the school; but for the members of LGO and IROG, it was truly a special day because everyone wants to share their purpose of giving to a lot of charming, little students that day. The staff of IROG Foundation wholeheartedly prepared the food that we were going to deliver to all Grade 1 students of the said school. But before I elucidate the topic regarding the food, I would like to share how we were all excited before we even departed from our office. While we were preparing to leave, we were already imagining the sweet responses we will receive from the children and it was enough reason for us to become more motivated. Even though it was hot outside and we needed to travel for a few minutes before we could even get there, all of us had enough strength to work hard for them because we were eager to perform this beneficial activity. At exactly 1PM, we left the LGO compound to begin our voyage to the school. All of us rode a jeepney to get there and during our trip, I could hear some of my colleagues’ excited conversations and their words were all filled with enthusiasm. While we were on our way to the school, I couldn’t help myself but imagine the endless gratitude we will receive from those children. 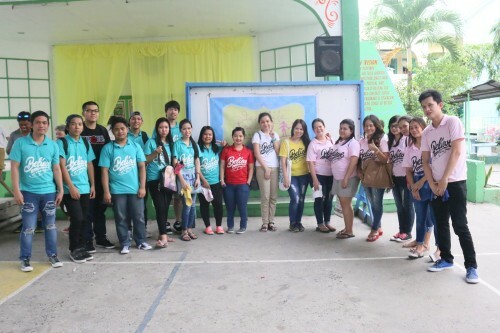 The thought of it made me more effervescent about our activity. A few minutes had passed since we left our office; and we finally arrived at our destination. Sta. Rita Elementary School has a tranquil surrounding and the moment we entered the place, I could feel the anticipation rushing through my veins. Watching the parents patiently waiting for their children inside the campus made me miss the old days. As we looked around, you would notice the simplicity of the school and appreciate its charm. It was only a moment but it felt like I had been visiting the school for a number of times already because I felt comfortable being inside the school grounds. But it was then that my colleague led me to where the staff of IROG Foundation was. Everything was set and they were only waiting for us to arrive. We rushed to the place and readied ourselves for our activity. And since it was a soup kitchen party, I already expected to see some delicious soup and to my surprise, there were also a lot of tasty bread. But before we even began, we didn’t forget to offer a prayer to God and express our gratitude towards all the blessings we received and asked His guidance to make this activity successful. After the prayer, everyone was now focused on serving the children. Our first destination was the farthest room of the left building. You can’t help but giggle once you saw the surprised expression from the students because they were all very cute with their shocked faces. 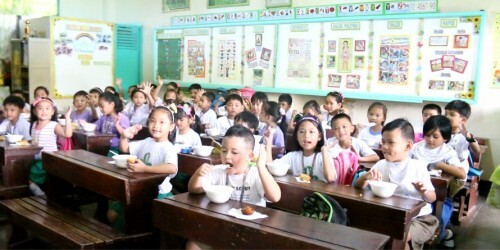 Each class gave us a warm welcome and you would have seen in their eyes that they were really happy and some of them couldn’t wait to taste the foods that IROG especially prepared for them. Some of the children were doing little cheers for us and kept on pointing at their location, telling us to go faster to them. The children were all charming and lovely, you will never have gotten tired looking at them being so joyful and thankful about their soup and bread. After we distributed their food, some of them already ate their bread, and it was cute how they said “It’s so tasty!” after just one bite. But their teachers never forgot to remind them that they needed to thank God first and offer a prayer before eating. Sta. 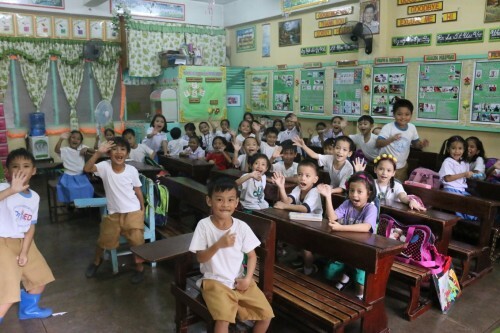 Rita Elementary School has 6 classrooms for Grade 1 students, and even though some rooms were quite far from each other, LGO and IROG members didn’t mind it. I could see some of my colleagues sweating hard from carrying the foods; but they still managed to smile and continued to pass happiness to the children. We were really touched seeing their bright expressions and their mellifluous way of saying “Thank you po” each time we gave them their food. With this activity, LGO and IROG Foundation aim to instill the value of service to those young souls. Before we left each classroom, we were encouraging them to always study hard and their responses were bright young smiles with a strong dedication and an honest “Opo” (Yes, we will). I personally translate those smiles as promises that they will do well in their studies and will build their future with optimistic minds. Because of those smiles, I’m confident that our activity truly provides good service to them. Being a part of this kind of activity makes me so thankful to our company; because aside from giving service to others, our visits at school and charities also teach us life lessons. “Soup Kitchen Activity” taught me how vulnerable children could be, and I realized that each of them really needs proper guidance. I’m suddenly glad schools exist. I’m hoping that this event showed them how much adults really care for their well-being. I also had the chance to see cute students while studying, a sight I rarely see every day; and seeing those students focused during their recitation or simply copying notes from the blackboard was indeed a delightful sight to see. And because we had more foods left, we also delivered them to some Grade 3 students and called some of the parents waiting outside to have some soup and bread. 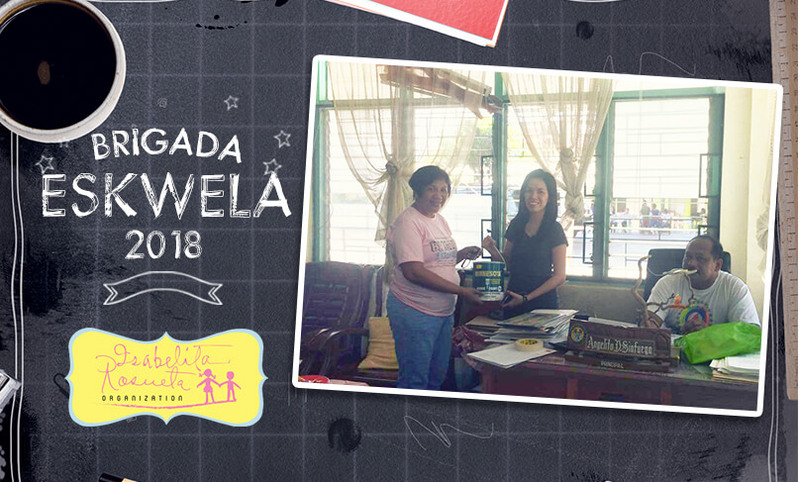 I understand that each of us has our own answer to what is the purpose of giving; and I’m glad that I became a member of a company that invariably provides the meaning of giving through activities like this. However, LGO would not be a company like this without Sir Joel Castillo, the founder of LGO and now one of God’s angels, who’s known as a kind of person who doesn’t think twice about giving help to other people, especially to those who are in need. The first time I became an employee of LGO and saw how Sir Joel, together with all the members of the company, did things, I felt overjoyed because it is not only about the growth of the company that was in the mind of our boss but also the welfare of other people and how to share his blessings with them. Everything about LGO and IROG is an eye-opener for me at first, such as how everyone treats each other as a family and how everyone participated in sharing their blessings and offering their help to other people. And it seems that our boss’ own definition of giving has been passed on to everyone, especially to me. LGO and IROG’s deeds taught me that genuine happiness doesn’t come from what we get but from what we give.